I may not be feeling well the entire week but as always, there are some beautiful things that came. One of which is the unexpected dinner treat from my Big Boss. He brought the entire office to one of his favorite restaurants. You can guess from the name of the restaurant, a place where you can have an amazing view of the city's sky line. We arrived around 5:30 pm, perfect time to witness sunset in Manila. In my opinion, this is the best time to visit Sky Deck. Seeing the sunset is already an attraction. A view of Intramuros, a historical landmark in Manila, established in the 16th century back when the Philippines was still colonized by the Spanish Government. We got the round table in the middle of the restaurant which was quite a regret. Although for bigger groups, Sky Deck automatically recommends this round table in the center of the restaurant. Great place and customer service are so far the best features I've experienced from Sky Deck View Bar. The most important and real reason why we visited the place didn't impress me well. If I were to give a rating, I have to say its 3 out of 5 stars for Sky Deck View Bar's food offering. We initially wanted to avail their buffet treat. Unfortunately, we learned that buffet is only offered on Fridays to weekends. We went for ala carte which was expensive for my budget. :) The Big Boss ordered a lot but the one that captured my taste buds is the Four Cheese Pizza. The rest of the we had like Callos, Sinigang na Bagnet, and Kare Kare were just fine. Sky Deck offers varied food selections in their menu. But mostly are Filipino-Spanish inspired dishes. Although if I will be asked if I will return and recommend the place, I would still say yes. 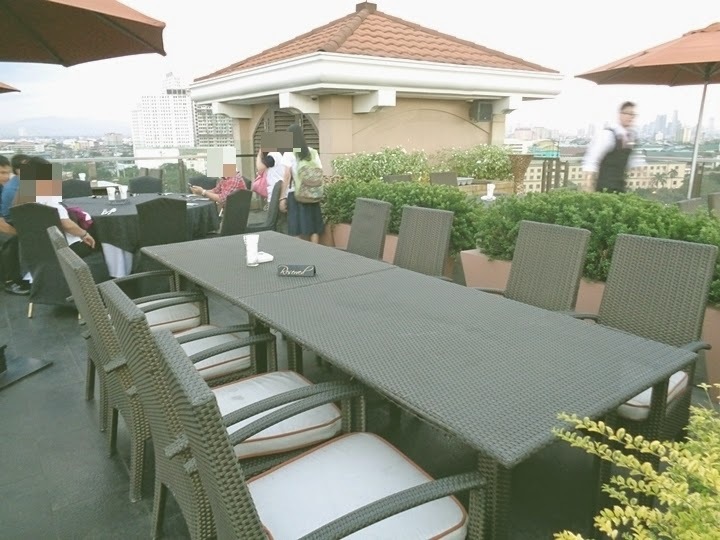 Sky Deck View Bar provides a quiet, hidden and quick getaway from all the hustle and bustle of Manila. 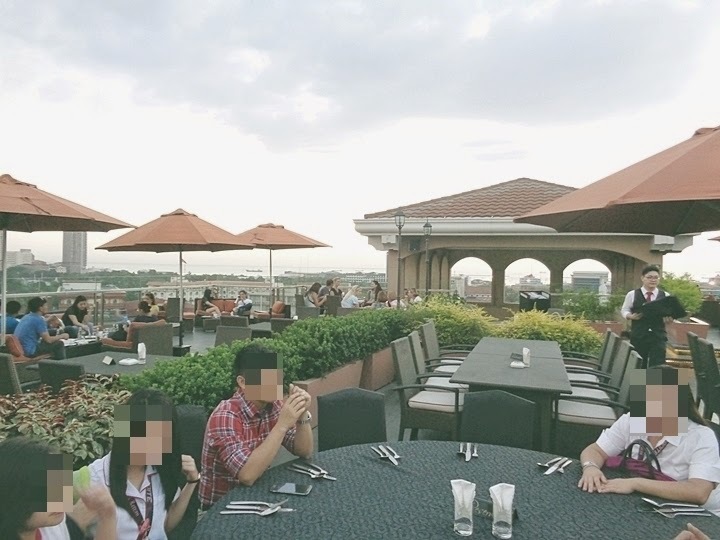 If you want to experience the lighter and silent side of Manila, Sky Deck View Bar in Intramuros is highly recommended. The place is so beautiful! Hi Dianne, I read from your previous post that you ordered from the book depository website. I purchased some books for a friend as a gift but we live in different countries so the shipping and billing address are different. I was wondering how did the people from the post office contacted you? Cheers!